Take a leisurely jaunt through Turkey to visit the extraordinary excavations at Ephesus, the underground city of Sarhatli on the ancient Silk Road and Istanbul's bustling city markets. No reviews yet for this trip. Browse other reviews below for Trafalgar. Fantastic accommodation, flights and travel . Nile Cruise was top quality experience. We truly felt that we saw the highlights of Spain. Very busy, really liked the 2 night stays. France is more than Paris and this itinerary proved it. We enjoyed all the places we visited, especially how we got priority as a tour group e.g. admission to the Vatican. Special dinners and venues were great. Quality of hotels was excellent. I have one complaint and that is THE COST OF THE OPTIONAL EXTRAS which are really an important component of the tour add up to a substantial amount by the end of the tour. They should be included as part of the overall tour cost, so that you know what the cost is when you book the tour. There should be ONE total fee at the start when we book the tour. It may be embarrassing if you cannot afford some of the optional extras because you have not budgeted for them. Please consider this suggestion. I will NOT go on another Trafalgar tour because it cost me and my wife an extra 1300 Euros for the optional extras which I believe were essential components of the Tour. Stand at the ancient crossroads between Europe and Asia, embarking on a journey of discovery through ancient lands and the marauding empires who fought to rule it. Arriving in vibrant Istanbul, you will be transferred to your hotel before joining your Travel Director and fellow travellers for a memorable Welcome Reception to kick off your epic adventure. Spend your day delving into a city where modern and ancient coexist effortlessly. 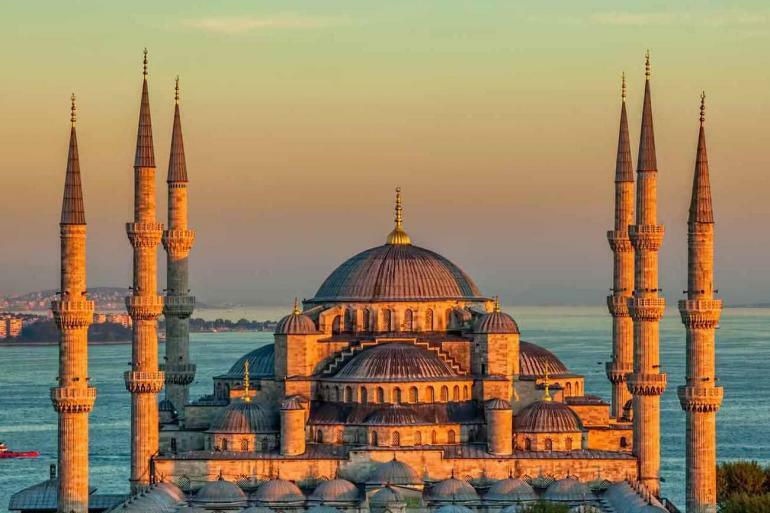 Visit Hagia Sophia, the Hippodrome and the exquisite Blue Mosque, said to rival even the Great Mosque in Mecca. This evening, consider an optional dinner with Turkish folk and belly dancing. Pay tribute to the brave souls who lost their lives at Gallipoli - the national pride of two nations, the Turkish and Australians, were awakened at the site of the bloody WWI battlefields and are commemorated to this day. See Anzac Cove and Dardanelles, and visit the cemeteries of Lone Pine and Chunuk Bair, the final resting place of many Allied soldiers. We continue to Çanakkale where we dine at our hotel tonight. Explore the legends of Troy and see the symbolic replica of the famous Wooden Horse the Greeks used to break their siege of this ancient city. Visit the ancient Asclepion Medical Centre in the city of Pergamon before retiring in seaside Izmir this evening where we'll dine at our hotel. Stroll through the ruins of the ancient Greek city of Ephesus, past the amazingly intact façade of the Library of Celcus and down to what was once its thriving port. See the House of Virgin Mary at Mt. Koressos then spend the rest of the day at leisure. This evening you may consider joining an optional dinner at a local restaurant in Izmir and indulge in some of the local raki. Leave the coastal city of Izmir behind as you journey inland to Pamukkale. Relax and enjoy the blissful thermal pools at your hotel before dinner. Tread in the footsteps of the ancients who sought relief and relaxation at the Roman health spa at Hieropolis, then admire the bubbling pools and delicate white cascades of water of Pamukkale's Cotton Castle Springs. Later, we travel through scenic countryside and join the Yazir community in the Taurus Mountains, where we'll 'Connect With Locals' and gain insights into their traditions at our Be My Guest lunch. Our stop for the next two nights is the Mediterranean retreat of Antalya. Enjoy some time on your own ambling through the winding lanes of its old city and admiring beautifully preserved Ottoman architecture. This evening, join your companions for a rousing Regional Meal at a local restaurant. Enjoy a morning on your terms to soak up the enchanting seaside atmosphere of the Turkish Riviera, embarking on an optional yacht cruise or relaxing at the hotel pool. This afternoon, we travel to the Roman city of Perge to visit the impressive Antalya Archaeological Museum and see treasures spanning the centuries. Your evening is free to find an inviting meyhane for some local chit chat and delicious flavours of kebab and baklava. Witness the world's best-preserved theatre of antiquity during your first stop in Aspendos this morning, before continuing to Konya, where we will gain insights into the mystical Whirling Dervish sect whose remains lie in the Mevlana Museum and Mausoleum. We continue to the Karatay Tile Museum, spellbound by its exquisitely Seljuk-tiled dome, before returning to our hotel where we'll dine tonight. See a well-preserved 13th-century caravanseray, at which weary travellers used to rest. We journey to Cappadocia with its honey-coloured rocky spires providing an enchanting backdrop for our visit to the underground city of Sarhatli on the ancient Silk Road. This evening, indulge in the flavours of traditional pottery kebabs during a Regional Meal at a local restaurant, before retiring to your hotel with beautiful views of the surrounding fairy chimneys. Tonight we stay in one of 'Trafalgar's Stays With Stories', located alongside the ancient Ortahisar rock castle. The other-worldly landscapes of Cappadocia take centre stage today as we explore its volcanic landscape dotted with caves and troglodyte dwellings. We visit the Göreme Open-Air Museum to admire the extraordinary rock-hewn churches and learn about the art of pottery making in Avanos before dining in our hotel this evening. Arriving in the youthful capital of Turkey today, we visit the Museum of Anatolian Civilisations and the final resting place of the country's beloved Atatürk, the first president of the modern Turkish nation. This evening we dine at our hotel in Ankara. Returning to Istanbul, we enjoy the rest of the day on our own. Delve into the depths of the Basilica Cistern, savour the intoxicating smells of the Spice Market or ascend Galata Tower for exquisite views of east and west. Consider an optional cruise navigating the waters of the Bosphorus before meeting your Travel Director and fellow companions for a memorable Farewell Dinner. Our epic journey into antiquity has come to an end as we bid Istanbul and newfound friends a fond farewell. Transfers are available. Conditions apply. Ferry across the Dardanelles from Eceabat to Çanakkale.